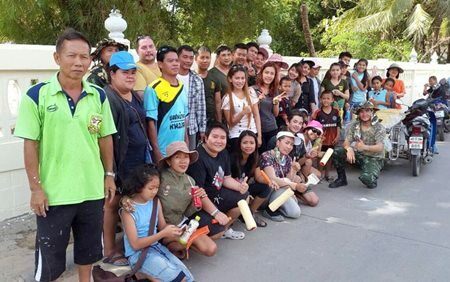 After a Briton took a bucket of paint to cover the dirty walls at Suttawas Temple, Thai neighbors of the Nongprue Sub-district joined in to finish the long-overdue job. Residents, soldiers from the 14th Military Circle and a smattering of other foreigners picked up paint brushes Dec. 29, seeking to complete a paint job begun Dec. 18 by Terry Smith, 77. Happy volunteer wall painters gather for a group photo. A video clip of the British Buddhist painting a long wall by himself went viral on the Internet, with many commenters asking why Thais citizens didn’t take the same initiative as a foreign resident. Nongprue Sub-district Deputy Mayor Wirat Thapthim said volunteers contacted the temple’s abbot after the video hit the Net. 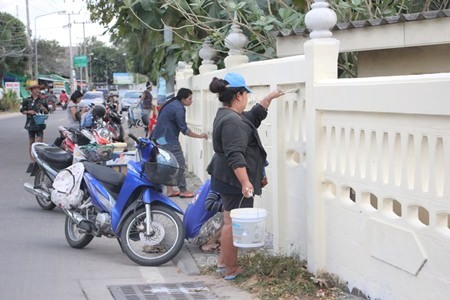 He coordinated with Mayor Mai Chaiyanit, who obtained 30 buckets of paint. Volunteers donated another 10 cans. Non-painters donated food and drinks for those working and most of the job was done before everyone took a break for the New Year holiday. The job was slated to be completed shortly after the holiday. Volunteers grab paint and brushes to refurbish the outside walls at Suttawas Temple.